the system. Oversized LED integrated into rear plate to indicate current filters or EFL selection. The manual focus is smooth and precise utilizing the precision ball screw nut. 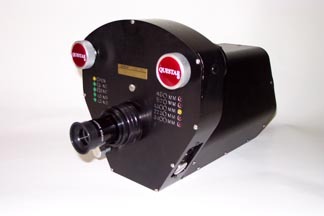 The oversized lens/filter contol knobs have a single turn detent stop for precise alignment of selected lens or filter. The lens is weatherized with protective clear optical flats front and back. The optical performance of the MFL 90 is superb, capable of resolving on television a 7mm feature at 1 kilometer.